Pacemakers, CPR instruction, bypass surgery—these are just some of the medical innovations the American Heart Association (AHA) has helped fund in its mission to end heart disease. It’s the country’s leading cause of death, and thousands more nonfatal cardiac events occur each year. Through groundbreaking medical research and community education on heart attacks and strokes, the AHA is dedicated to changing these numbers. Now, the nonprofit is working with researchers to use analytics and data science to change the face of cardiovascular medicine. “For nearly a century, the AHA has saved and improved lives,” says Jennifer L. Hall, Ph.D. “From changing the way heart disease and strokes are cared for in hospitals to making breakthrough discoveries, these advances help more families share more time together.” Hall is chief of the American Heart Association Institute for Precision Cardiovascular Medicine. Precision medicine offers tailored approaches to disease prevention and treatment by taking into account an individual’s genetics, environment and lifestyle, and Hall is excited about how it will change doctors’ and researchers’ approach to cardiac health. “We’re on the path to preventing heart disease and strokes and establishing better-targeted, safer and more effective treatments, all by leveraging state-of-the-art analytics and data science,” she explains. The Institute for Precision Cardiovascular Medicine is the only entity focused exclusively on advancing precision medicine in cardiovascular care, and it’s paving the way toward better treatments and preventative strategies to help people live longer, healthier lives, according to Hall. It provides research grants for data scientists, clinicians, computer engineers and other experts. “The grantees funded by the institute have made tremendous progress in the areas of imaging and data analytics in cardiovascular medicine,” she says. “Along with our strategic partner Amazon Web Services, we have established the Precision Medicine Platform, which enables researchers to discover and analyze data using the power of cloud computing.” The AHA expects that the convergence of science, technology and information access will lead to more health-care changes in the next 15 years than were made in the previous 50. The AHA is currently investing nearly $5 million in 32 studies at St. Louis-area research institutions. 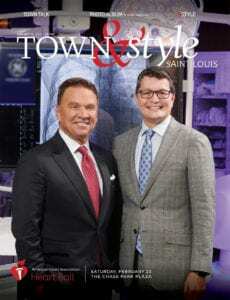 The nonprofit is able to support important medical research and technological innovation because of fundraising efforts such as the St. Louis Heart Ball, one of its most vital local events. 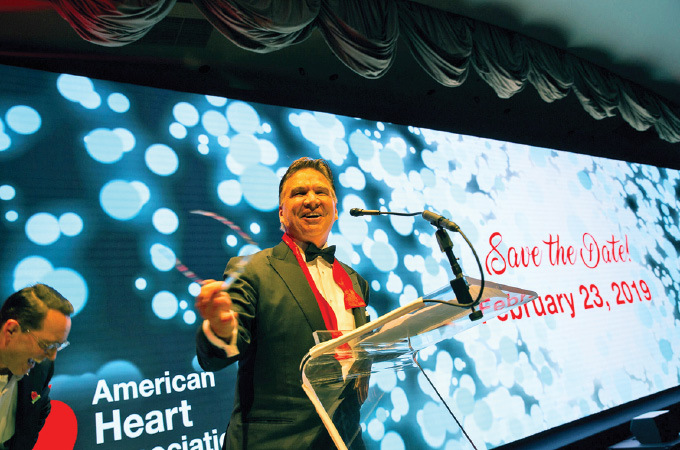 “We are grateful to St. Louis for supporting the Heart Ball and the AHA,” Hall says. “As scientists, we value every research dollar. Every day, our goal is to find solutions for better treatments.” This year’s gala is Feb. 23 at The Chase Park Plaza. The event chair is Ron Kruszewski of Stifel, presenting sponsors are Express Scripts and Stifel, and World Wide Technology is legacy sponsor. Pictured above: Event chair Ron Kruszewski addresses the 2018 Heart Ball attendees. The American Heart Association is dedicated to building healthier lives free of cardiovascular disease and stroke. Its St. Louis Heart Ball is Feb. 23 at the Chase Park Plaza. 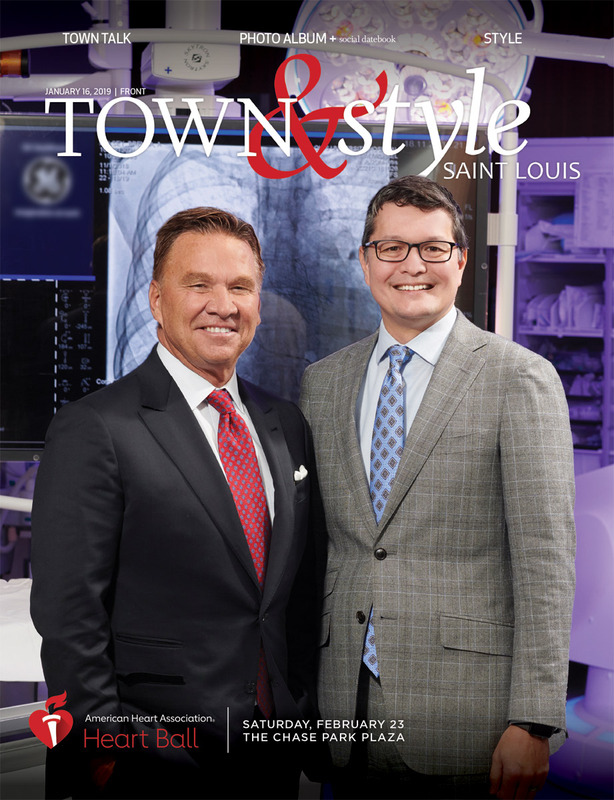 Pictured on the cover: Heart Ball chair Ron Kruszewski of Stifel and 2019 Hugh McCullough Medical honoree Dr. Michael Lim. For more information, call 314.692.5625 or visit heart.org/stlouis.